Please call (336) 222-5030 for additional information. Burlington’s City Park Carousel is currently closed. Our carousel is over a century old. It was last refurbished by a group of dedicated community members in the 1980s. Now, 35 years later, this piece of art in motion requires complete refurbishment and restoration of both its artistic and mechanical elements. Carousels & Carvings, Inc of Marion, Ohio will hand carve and repaint our menagerie of carousel animals, repair and fabricate new mechanisms, upgrade our drive unit, and add an ADA accessible chariot and ramp. Unfortunately, this work is painstaking and is estimated to last two years. We are so sorry that our crown jewel won't be available while it is being repaired, but this investment of time and money will ensure that our Dentzel Menagerie Carousel will last for generations to come. The Burlington City Park Carousel is a 3-Row Dentzel Menagerie Carousel built around 1906-1910 at the Dentzel Carousel Company on Germantown Avenue in Philadelphia, Pennsylvania. 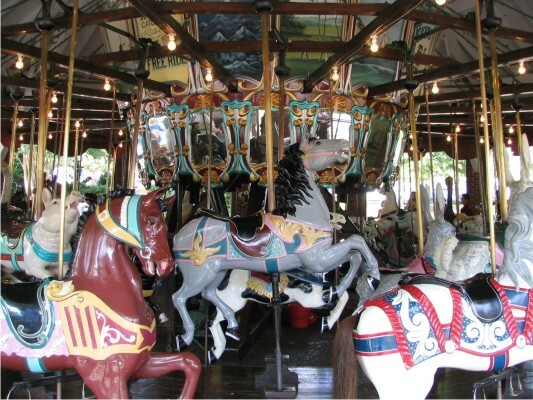 The Carousel was purchased by the City of Burlington in the summer of 1948 from Mr. Carl Utoff, the owner of Forest Park Amusement Park in Genoa, Ohio. Mr. Utoff purchased the machine in about 1924 from Locust Point Amusement Park in Oak Harbor, Ohio. No one knows the exact date of our Carousel or where it first ran, but the mirrors are stamped March and April of 1913, and on the bottom of the wooden platform were penciled May 1914. One of the rounding boards is a copy of a 1903 Remington painting. Our frames and rounding boards are similar to one in the 1906 era. Our chariots are numbered VIII and IX, meaning that at one time they were together, in a pair, on a larger carousel. The early 1900's were known as the "Golden Era" for carousels and many were sent back to be refurbished or made into different carousels. Parts made in different years were put together and perhaps our Carousel was one of those. There are 46 hand-carved wooden animals including 26 horses, 4 each of cats, ostriches, rabbits, and pigs; 1 each of a deer, giraffe, lion and tiger, and 2 chariots. These animals are hand carved out of bass and poplar wood and are a hollow series of boxes and wood pieces glued together with hide glue into the basic shape, and then carved by hand. The Dentzel carvers were noted for their realism with carving of the veins and muscles of the animals. The eyes are glass with pupils, and the tails are real horsehair. The mechanical make-up of the Carousel is unique, as it contains many unusual types of bearings and gears, as well as an unusual clutch system. The many who ran the carousel while in Locust Point remembers going out in the mornings and attempting to start the single cylinder gas engine that once powered the Carousel. It was later changed to an electric motor prior to its coming to Burlington. From 1981-1985, the Carousel animals and oil paintings, the center support system, the Carousel building, and all of the mechanical parts of the Carousel underwent a complete restoration. Stemming from a service project undertaken by the Alamance County Service League, the restoration spread to include hired and professional furniture refinishers - J.R. Finishing & Co. whose job included hand stripping all animals and making the necessary repairs according to a system compatible with the paint system used. Several artists were hired as assistants, and with the help from many community volunteers, the City Maintenance Department, the Furniture Refinishers, and the Recreation & Parks Department, the housing, animals and frames were done within a two year time period. The rounding boards also underwent a restoration as many layers of paint were scraped off to expose the original scenes underneath. Several local artists restored the original paintings to the beautiful condition presently on the Carousel. The inner scenery panels that rest above the mirrors on the center pole were also missing their original canvases. Descriptions of the original scenes were described by persons riding our Carousel when it was in Ohio, and these descriptions combined with photos from another Dentzel machine similar to ours, were put together with Karen and Duane Burchett's help. These are the paintings you see today when you visit the Carousel. In January 1985, the Carousel was completely taken apart and the mechanical parts were thoroughly checked, cleaned, repaired and/or replaced by Mr. Tom Wolf of Tennessee, the City Maintenance Department, and local businesses. With new jumping gears donated by Lessona, Inc., the machine is one of the newest "Old" Machines around today. Season passes to this Historical Treasure are available through the Recreation & Parks Department's Administrative Offices or the City Park Concession Area during normal operational hours. The Carousel is open Easter weekend and each weekend until school is out for the summer. Once school is out the summer hours of operation are Tuesday through Sunday until schools begin in the fall. The Carousel is available for school groups and organizational outings from Easter until school is out in the spring.